ARCATA – Having declined to strike aspects of its panhandling ordinance, the City of Arcata will have to defend itself against a lawsuit from a well-known political consultant. Arcata resident Richard Salzman, who has helped coordinate the campaigns of District Attorney Paul Gallegos and several other liberal candidates, announced his filing of the lawsuit on May 19. It attacks the ordinance’s prohibitions against spoken and written requests for handouts, arguing that they’re unconstitutional. Salzman is asking the court for an injunction on enforcing the ordinance, a declaration that it’s unconstitutional and recovery of costs involved with filing the lawsuit. The ordinance’s prohibition of aggressive panhandling isn’t being challenged in the lawsuit. In a press release, Salzman alleged that the City is violating basic civil rights and targeting the poor. “If first they silence the poor and the homeless, and I say nothing, who will speak up when they try to silence me?” he asked. The City Council approved the ordinance last year but Arcata Mayor Susan Ornelas and Councilmember Shane Brinton voted against it. The council recently voted not to amend the ordinance, with Brinton casting a lone dissent vote. In addition to banning aggressive panhandling and solicitations, the ordinance prohibits begging within 20 feet of businesses, parking lots, banks with automatic teller machines, bus stops, foot bridges and intersections. In an interview last February, when Salzman notified the City of his intent to sue, City Attorney Nancy Diamond said the ordinance is modeled after what’s been done elsewhere in the state and country, and what’s been tested in court. 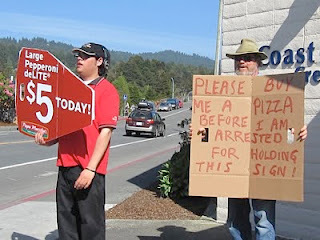 Arcata, CA – On Thursday May 19th Richard Salzman filed a lawsuit in Superior Court of California against the City of Arcata claiming that their Panhandling Ordinance is unconstitutional. 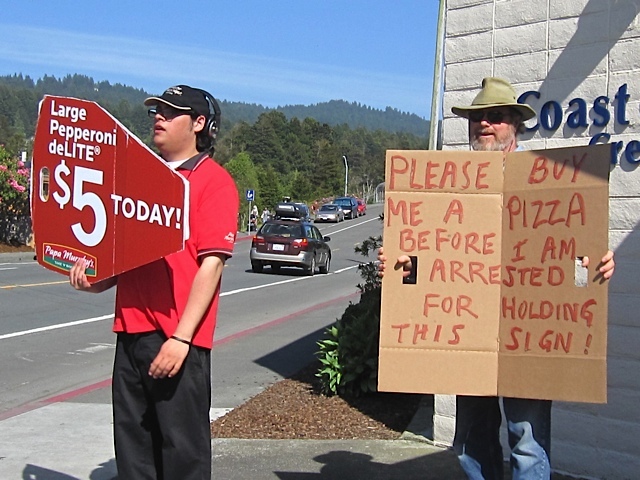 In March the City of Arcata declined Salzman’s request to amend its panhandling ordinance. ”I requested that they amend their ordinance so as to comply with our guaranteed protection of free speech as outlined in the United States Constitution. Since they declined to do so I felt compelled to file a complaint yesterday in the Superior Court of California against the city” said Salzman. Salzman has stated that he is a proud lifelong member of the American Civil Liberties Union (ACLU) and staunch defender of the Constitution of the United States and the First Amendment right to free speech. As written, the ordinance makes it a crime to merely hold up a sign asking for a hand out. By denying citizens constitutional right of free speech, Salzman contends the City Council overstepped its authority. “If first they silence the poor and the homeless, and I say nothing, who will speak up when they try to silence me?” Salzman asked. He notes that the section of the ordinance against “aggressive panhandling,” including blocking one’s path, any physical contact or shouting, was left unchallenged by this legal action.